This shakshuka recipe is dedicated to all egg lovers out there. 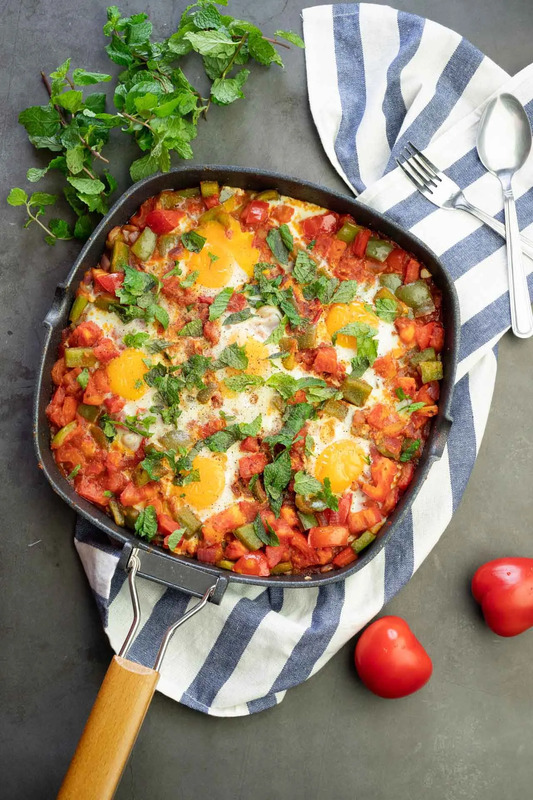 If you guys know me, you know I love eggs and easy-to-make recipes, and lucky for me this shakshuka recipe answers to both. I’m in heaven right now! If you have never tasted shakshuka before, you are in for a treat. Shakshuka, pronounced /shahk-’shook-kah/, is a dish that is made with eggs poached in a bath of tomato and vegetable stew that is packed with lots of aromatic spices. The dish is usually made in one single pan— usually a cast iron skillet or a clay dish, making it easy and fast to clean. This is one of the reasons why the dish is loved by many. Despite being widely famous and universally popular, many people might not know where the dish came from. In fact, the actual origin of the dish is still a debate. Many believe that the dish originated from Arab cuisine where countries like Yemen and Egypt made a sort of tomato stew, then later it spread to other regions such as the Mediterranean and the Middle East, and then to North Africa where they started adding eggs to shakshuka. Meanwhile, some people even believe that the dish might be a variation of the famous Mexican huevos rancheros. Origins aside, we still love shakshuka for its simplicity and heavenly flavours. But what if I told you, we can make it taste even better? Let’s break it down to its core. Shakshuka is basically poached eggs and tomatoes, right? Now, tell me, what goes well with eggs and tomatoes? Speaking of eggs and toasted bread, I have this simple and delicious scrambled eggs recipe that will pair perfectly with toasted bread. If you’re an egg and bread lover, don’t miss out on this recipe. Back to the shakshuka— do you know what else goes well with tomato? CHEESE! If there is one thing we all have to thank the Italians for, it’s for their great invention of combining cheese and tomato in a dish. The rich and creamy taste from the cheese just goes so well with the sharp and tangy tomato stew. You can use any cheese you like, but I highly recommend the salty feta cheese as it would intensify the flavor of the whole dish. You can also add a few changes to your shakshuka by adding minced beef or lamb, or even sausages. Maybe you can even serve a bowl of salad and some pasta alongside the shakshuka to add some freshness and to make the dish more wholesome. Feel free to customize however you want, the possibilities are endless! If you happen to make a big pan of shakshuka and end up having leftovers, just put the pan in the fridge, covered in cling film, of course. When you’re ready to eat the next day, unwrap and bring the whole pan to the hob and cook on medium heat. You can add a little bit more water if your shakshuka is drying out. Also, it would be great if you have finished all of the eggs from the night before. So for the next day, you can crack in new eggs into the pan when you reheat the dish. If you do have leftover eggs, however, I suggest scrambling the eggs into the tomato and veggies, as leftover poached eggs can have an odd texture. Now then, shall we hit the kitchen? If you’re a busy person who loves eggs and easy-to-make recipes, this shakshuka recipe is the one you need. Imagine getting a pan of perfectly poached eggs in a bath of tomato and vegetable stew in just 30 minutes. It’s also great to share with your loved ones. In a large cast iron skillet, heat up the olive oil on medium heat. Add diced onions, green bell peppers, coriander, paprika, cumin, and a pinch of salt. Stir constantly and cook for about 10 minutes or until the vegetables are softened. Add minced garlic and stir until fragrant, for about 30 seconds. Add chopped fresh tomatoes, tomato sauce, sugar, and a pinch of black pepper. Stir well to combine all of the ingredients, then simmer for 10 minutes or until the mixture reduces and becomes less liquidy. Taste for seasoning and adjust if needed. Make 6 wells in the mixture, with each well being far apart from one another. Crack an egg into a small bowl, then gently pour the egg into each well. Turn the heat down to medium-low and cook covered or until the egg whites are cooked and the yolk is barely set. Remove the lid and garnish with freshly chopped mint, and red pepper flakes. Serve warm with toasted bread of choice.